OK, yes, liver is smelly. But, there are many reasons to take the plunge and start making liver dog treats. Liver dog treats, as well as other homemade dog treats, are completely customizable for your individual dog. 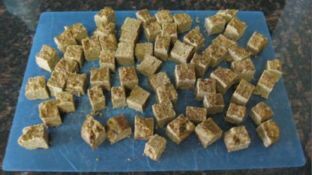 There are other smelly dog treats that we buy for our dogs, why not make a healthy homemade treat, which will probably cost less than store bought treats. With our tips and recipes, you'll make the tastiest liver treats that will have your dog doing back flips in no time. Face your smelly fears, grab your apron and let's start making the best liver dog treats. In the process we'll make you look like an epicurean hero to your dog. Here are a few tips to get you started and on how to choose liver for homemade dog treats. 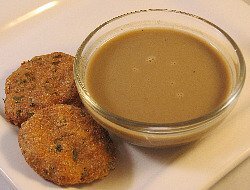 Start with the most versatile liver dog treat recipe our lip smacking liver gravy (pictured below). You can use it as a food topper, or drizzle on other dog treats for a special treat. You can even freeze the gravy for a cool and tasty treat. 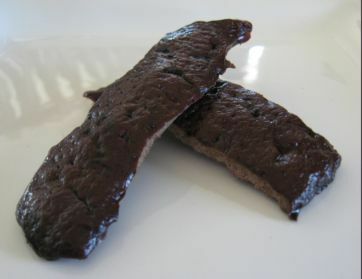 Or, you can try a tasty "brownie style" liver treat recipe like our highly rated liver & carrot brownies. Also try the classic liver treat, dehydrated liver dog treats. Nothing but pure delicious flavor. a Puzzle Toy for Your Dog? This first video is of a dog's first try playing with a puzzle toy. Sometimes a dog needs three tries to figure out a puzzle treat toy. "Love your recipes! My Newf (Newfoundland) give them a 4 paw star rating." "I really like your site, and think it's a great idea. I know my dogs would agree!"